added on the 2019-02-20 22:02:45 by JAC! 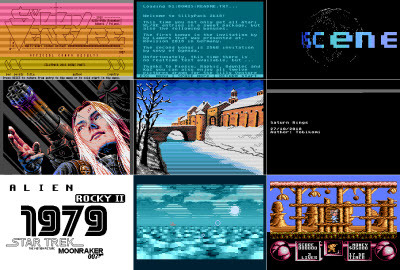 the graphics and music releases for which no art pack/music disk exists. can directly start all releases and read the readmes. entries much more fun, especially on the real machine. If you use loadable speeders, you have to use the memory area $500-$5ff. For "SIO2SD TURBO" for example press "OPTION+START" at the boot screen. * Pressing any key while the menu is loading takes you to the DOS shell. * Pressing RESET in the menu performs a cold start. * Pressing RESET in while a release is running returns to the menu, if possible. * Further controls are displayed in the menu itself. Original ASCII artwork by NE7, Music "Disse" by 505, menu by JAC! This download also contains a pre-configured Altirra installation. Just extract the archive to a folder and run "SillyPack2k18.bat". For the Rapidus demos run "SillyPack2k18-Rapidus.bat". added on the 2019-02-20 22:06:00 by JAC! thanks for this great compilation of all the entries! Thank you once again for your massive work, JAC! I really appreciate it. One night full of ATARI entertainment, thx! I was waiting for this :) Thanks! page created in 0.020919 seconds with 15 queries.